Finally, a droid that's even more feminine than C-3PO. Unable to fully trust anyone around him, Prince Xizor, head of the Black Sun organization, sought out a completely loyal lieutenant. The sum of nine million credits bought him Guri, the first and only Human Replica Droid programmed as an assassin. Her physiology was designed to mimic human anatomy, and her personality was cool and even-tempered. There was an entire collection of Shadows of the Empire figures back in 1996, but only a handful of new characters were made - mostly Hasbro used the line as an excuse to release Original Triology characters. So while we got two versions of Prince Xizor, we didn't even come close to Guri (unless you count the Micro Machines figurines). There was concept art drawn up for her, but it never came to be. To make this figure, I used the body from a 1997 POTF2 "Ewok Celebration" Leia and the head from the 1998 Expanded Universe Mara Jade. If you're really feeling industrious, you could smooth out the straps of her sandals and the details on the dress, but they don't really stand out too much. No accessories, but she didn't really use any. 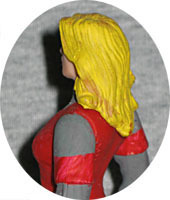 Guri is a 3¾" figure with five points of articulation: waist, hips and shoulders (her hair keeps her head from turning). There still aren't any plans for an official Guri, even though there will be new SotE toys soon. Luckily, it's easy to make your own.